Hemorrhagic Telangiectasia Definition (HHT) is an inherited condition which results in the formation of abnormal blood vessels known as arteriovenous malformations (AVM) in different areas in the body including the mucous membranes, skin and in organs like the liver, lungs and brain. 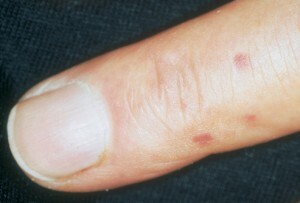 When growing on the skin, these blood vessels can be referred to as telangiectasias. 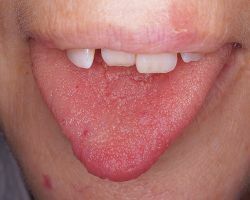 The disorder is also referred to as Osler-Weber-Rendu Syndrome and Osler-Weber-Rendu Disease. It is difficult to determine the incidence of HHT because mild cases of the syndrome may go unnoticed due to lack of evident symptoms. In addition, AVMs may be related with some other disorder. Studies show HHT to be a fairly common condition, occurring in 1 out of every 5,000 to 10,000 people. According to its prevalence statistics, it can affect people from various ethnic groups all over the world. Genetic mutations are the main trigger factors for this syndrome. The defective gene is inherited by an individual from one of his or her parents. It can also result from new mutations in certain genes. However, the factors that trigger these mutations are not known. Mutations in the ENG or ACVRL1 genes are responsible for over 80% of the total cases of HHT. More than 600 different mutations in the gene are known. MADH4 gene mutations, which also results in colonic polyposis along with HHT, is the main cause behind the condition in about 2% of the total cases. It is still not clearly known whether mutations in the ENG and ACVRL1 genes, apart from the MADH4 mutations, lead to any specific symptoms. According to some case reports, ENG mutations increase the risk of lung cancer while mutations in ACVRL1 gene may result in serious liver problems and pulmonary hypertension. Researches show that people having the same gene mutations often have different symptoms with various severity levels. This suggests the possible involvement of some other risk factors and gene mutations which have not been identified. The disease follows the autosomal dominant inheritance pattern, meaning that only one copy of the defective gene is enough to cause the disorder. Individuals suffering from HHT are at 50% risk of passing on the mutation to their offspring. However, it can be caused by new gene mutations in people with no family history of the condition. Genetic testing is sometimes used for detecting any alteration in the genes associated with the syndrome. The treatment mainly focuses on treating the symptoms rather than the disease itself as it is not possible to cure the syndrome. The mild cases of HHT generally do not require any treatment. But in the moderate and severe cases, timely treatment is required to avoid various serious health problems like a stroke resulting from AVMs in the lungs. Acute bleeding can be treated with blood transfusion and other attempts to stem the blood flow. Laser coagulation therapy can also be used for treating nosebleeds. Another treatment used for severe epistaxis is septal dermoplasty or nasal septum skin transplant. The skin lesions resulting from the syndrome can be cured with dye laser surgery or cautery. This procedure is generally carried out by a dermatologist. Iron replacement therapy is useful for the management of anemia resulting from the GI bleeding. A doctor may consider endoscopic treatments and blood transfusion in case the iron replacement fails to relieve the symptoms. AVMs in the brain and some other parts of the body can be treated with endovascular embolization. Estrogen therapy can successfully reduce the episodes of bleeding in some patients. Stereotactic Intracranial Radiosurgery or liver transplantation may be necessary in severe cases of the condition. Sometimes, surgery is necessary to stop bleeding in certain areas. HHT is a lifelong disease. Proper treatment, along with regular follow-up, allows its patients to lead a normal life by keeping the symptoms under control. However, patients continue to suffer from occasional periodic disability due to bleeding from some specific body parts or some serious complication. This syndrome can cause several complications, some of which can even be life-threatening. Thirty to sixty percent of all patients are likely to have liver involvement while twenty-five percent to thirty percent tend to suffer from gastrointestinal bleeding. Around ten to twenty percent of the HHT patients tend to have CNS (central nervous system) involvement. Usually, HHT does not affect the life expectancy of its patients. In severe cases, however, the abnormal blood vessels may lead to serious complications and even the death of sufferers. The condition is associated with a ten percent mortality rate where individuals with the syndrome eventually die due to the complications resulting from the disease. Couples having a family history of HHT should consider genetic counseling before having a child, as it helps to assess the chances of the baby being born with the disorder. It is not possible to prevent it when caused by new gene mutations due to the unknown etiology. The stroke and heart failure caused by the arteriovenous malformations can be prevented by proper medical treatment. Here are some pictures displaying the AVMs associated to the condition on different skin areas. HHT is a common genetic condition which requires early diagnosis and timely treatment. A number of foundations and organizations have been formed to provide accurate information and proper guidelines associated to this disorder.